Imagine leaving your doctor's office with a prescription for a violin concerto rather than pills. While this might sound like you should drive right to the nearest record store and pick up some CDs, such a referral actually involves sessions with a certified music therapist. Over the last decade, music therapy has been used to treat a variety of conditions, including chronic pain, nausea and depression and anxiety. It has also been found to improve cognitive function in people with Alzheimer's disease and other forms of dementia, and to provide comfort during the end-of-life process. A 2006 study has found that music therapy is beneficial in cancer patients undergoing bone marrow transplant, an often-difficult procedure in which bone marrow is temporarily removed so that high-dose chemotherapy can be given. Below, lead study author O.J. Sahler, MD, Professor of Pediatrics, Psychiatry, Medical Humanities, and Oncology at Golisano Children's Hospital at Strong in Rochester, New York and Rosemary Oliva, MT-BC, the music therapist for the study, explain what music therapy involves and how it eased the recovery of the bone marrow transplants in their study. O.J. SAHLER, MD: The American Music Therapy Association defines it as the prescribed use of music to achieve a predetermined goal. It involves music that is specially chosen by the therapist and the person who is receiving the music therapy to achieve a goal that they have determined they want to achieve. 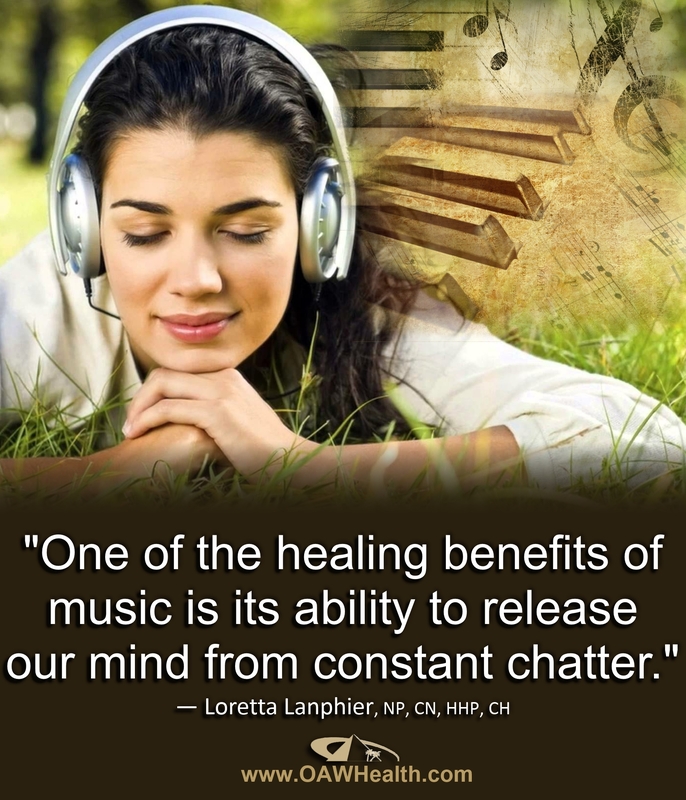 There are many different facets of music therapy. It can involve listening to live or recorded music. It can also be about making music. You can make music by playing a particular piece that you know or learn, or you can write your own music. The music therapist can also write music to go with words that patients have written. And sometimes the music therapist will ask people what their favorite songs are and do what we call lyric analysis. That will explore why a particular song resonates with the patient. What are some of the settings in which it's been used? ROSEMARIE OLIVA: Music therapy has been used in various hospital settings, especially in psychiatry. It's also been used in special education, nursing homes, psychiatric facilities and correctional facilities. What can a music therapy session involve? ROSEMARIE OLIVA: Sessions are client-oriented, especially in the hospital setting. I go into the room and find out how people are feeling and work with that. So if they're feeling nauseous, I might try to distract them from thinking about the nausea. I would have the patient select music, and then do what I call progressive muscle relaxation, where you're tensing and releasing your muscles from head to toe. Eventually we'll get to the stomach and maybe at that point they've forgotten about the nausea. Some sessions involve guided imagery. There's actually a separate sub-school called the Bonney method of guided imagery with music. With that type of imagery work, a piece of music is played and the client is told to close their eyes and say whatever comes to them while the therapist guides them through it. So it's very open-ended; it's very much like a psychotherapy experience. What I do is more of music-assisted guided imagery, where I'm giving patients specific images to think about rather than allowing that exploration. Why did you decide to conduct your study in patient undergoing bone marrow transplant? O.J. SAHLER, MD: The director of the Nazareth College Music Therapy Program here in Rochester wanted to introduce music therapy into a hospital setting and thought children with cancer might be a receptive population. Many of our kids who come in for treatments are here for days and sometimes many weeks and months. We were hoping that music therapy might be a way to help distract them from some of the painful experiences that they were having, including bone marrow transplant. Meanwhile, there were requests for additional support from adult bone marrow patients to help them through what they understood was going to be a very trying and oftentimes uncomfortable procedure for which they might be hospitalized for a couple of months. We began to offer music therapy to the adults in the hopes of being able to make this a more permanent offering in our bone marrow transplant unit, and decided to conduct a pilot study to find out whether or not we were doing any good. What did your study measure and what did it find? O.J. SAHLER, MD: We were interested in whether music therapy, given two to three times a week for the duration of the hospital stay, had had any effect on the degree of pain or discomfort that people were experiencing. We chose two parameters that are very common in bone marrow transplant patients: pain and nausea. Before and after a session of about a half hour, we asked patients to express on a 1 to 10 scale how much pain they were feeling and how much nausea they were feeling. And what we saw were some dramatic decreases in their reported pain and nausea. We also looked at whether the patients who had been receiving music therapy derived any benefit immunologically. The immunologic marker that we chose was something called time-to-engraftment. And engraftment is the point at which it becomes clear, through laboratory studies, that the bone marrow,which produces white blood cells that fight infection,is beginning to function. We found that people who received music therapy regained immunologic function faster than people who were not receiving music therapy. During the bone marrow transplant process, people have virtually no immunologic competency; they are subject to all sorts of infections that can be life threatening. So if we can decrease the amount of time that someone spends in jeopardy, then that is certainly adding to the benefit of the treatment as a whole. How might music therapy improve immunologic function? O.J. SAHLER, MD: In our study, we encouraged people to use music therapy for relaxation and stress reduction. We know from studies,mostly in animals but some humans,that music has an effect on an organ of the brain known as the amygdala, which is considered the seat of emotion. If you have a certain musical beat, you can actually watch brainwave frequency change in response to the music that is being played. The amygdala has a lot of neuronal connections with the hypothalamus and the pituitary. And both glands have an effect on the adrenal glands. It's in the adrenal gland that cortisol, a stress reactant, is manufactured. When you have high levels of cortisol circulating in the body, you tend to be in sort of a fight-or-flight kind of tense state. Being in this heightened, hyper-alert state for a long period of time can become very exhausting. But if you are able to slow amygdala firing, you can slow down firing to the hypothalamus and the pituitary, which in turn will slow down firing to the adrenal gland and slow the production of stress reactants. When you're able to decrease the amounts of circulating cortisol, you facilitate production of immunologic agents. So that's the current thinking, neuroendocrinologically, of what might be happening. Do study participants seem to enjoy music therapy? ROSEMARIE OLIVA: Yes, we have had people who sign on and aren't quite sure if they're really going to like it. And typically, those who sign on are very satisfied with the intervention and glad that they participated. O.J. SAHLER, MD: Oftentimes, these patients are older men who aren't quite sure that this is going to be any good and their wives have perhaps taken the upper hand and said, "Yes, you will participate." Almost inevitably they come away from the experience one of our definite supporters. And it's just been marvelous to watch. Is there certification for all music therapists? ROSEMARIE OLIVA: After finishing undergraduate or graduate level coursework in music therapy, there is a six-month internship process that you are required to complete, and then you take a certification exam through the Certification Board for Music Therapists. How can people find a music therapist? ROSEMARIE OLIVA: Ideally, there'd be a music therapist at each hospital. If there isn't a music therapist available, you can find one through The American Music Therapy Association, which has a website, www.musictherapy.org. If there's a local university that has a music therapy program, you might contact the chair of the department. And oftentimes you will find music therapists in schools with special education programs.